Below is a sermon I was privileged to share at St. John’s Cathedral, Jacksonville, FL, on Thanksgiving Day. I share it here because it helps describe and capture the spirit of new urban ministry as we strive to “build a church without walls.” Thanks be to God for the opportunity to attempt, though limited in scope and vision, to do his will. To love God and neighbor. To welcome all. May only your word be spoken here, O Lord. May only your word be heard. some kind of wonderful meal. and relax and enjoy the fruit of God’s abundance. and trays full of mugs of coffee with cream. in its simplicity is holy and life-giving. most prevalent in our culture. have God’s favor in a way that others do not. We must be doing something to deserve this favor. is the idea that folks who are struggling. these folks must somehow be doing something wrong. There is nothing wrong with prospering and doing well. the unmerited gift that is Jesus Christ. rather than the truth that we all sin and fall short. of Christ who poured himself out for all. Imagine living a life defined by chronic instability. Or your parents struggle to find work. Imagine going without food some days. on a friend’s couch another, and so on. the welcome of family or friends. And then imagine hearing today’s gospel. Don’t worry about what to wear or what you’ll eat. to conclude that God had somehow abandoned you? for those in high places, with power and influence. toward a more just society. into the world where the people are. First and foremost, it is a ministry of presence. to dinner in the most unlikely places. people who ordinarily would not mix. ministry with street folks or people in shelters. we do within the parish walls. 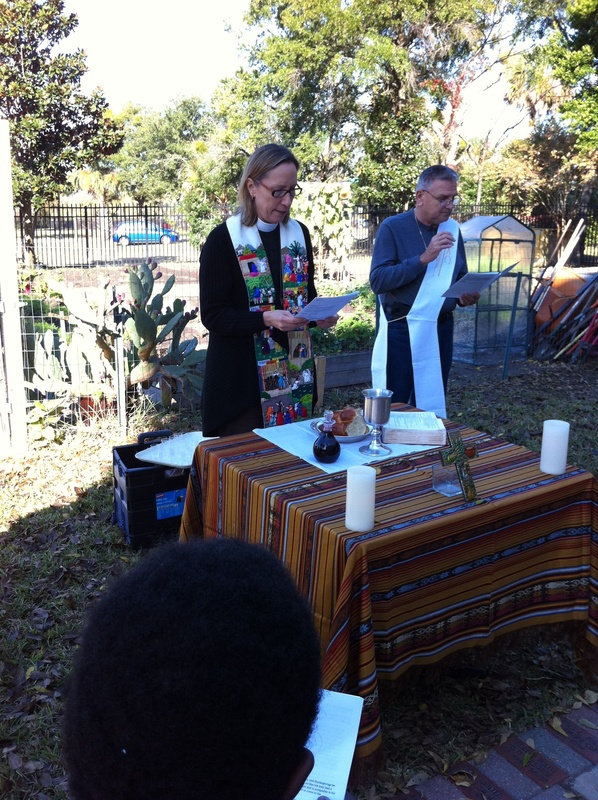 Next month we hope to launch regular outdoor worship. but in forming meaningful community. with those who may seem quite different. we place ourselves in a position to be transformed by God. the Holy Spirit is creating community. and Morning Prayer on Wednesdays at Clara White Mission. 300 folks who are lined up outside. to reflect on scripture and to pray. We are beginning to know folks — and to be known. a man called me over, by name. “I need to talk to you, Mother Beth. would not go to the hospital. This man and his friends were worried. his friends’ concern, he was blown away. “Really, somebody came to you about this?” he asked. I told him he has some good friends. in our little community in just 6 weeks? Strive first for the kingdom of God and his righteousness. all people are valued and included. we are saying “no” to the kingdom of God. It’s a symptom of our flawed humanity. And that, my friends, is enough to begin. This entry was posted in 12-step spirituality, Christianity, congregational development, Diocese of Florida, Episcopal church, faith, Interfaith, Ministry, peace, Recovery, unity and tagged 12-step spirituality, Christianity, community, holy ground, homelessness, mercy, option for the poor, recovery, street ministry. Bookmark the permalink. 6 Responses to Without walls. Beth, in my opinion you knocked the ball out of the park, cleared the bases. Excellent message of hope, one that fills me with gratitude. Thank you x 2. What a beautiful message… Your posts… Your love… continue to inspire me. Great message at a great time! The world is hungry for hope! Keep up the great momentum! !